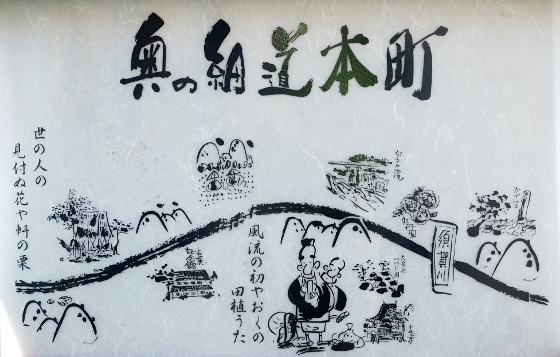 Leaving Shirakawa, Basho traveled to Yabuki and then to Sukagawa. 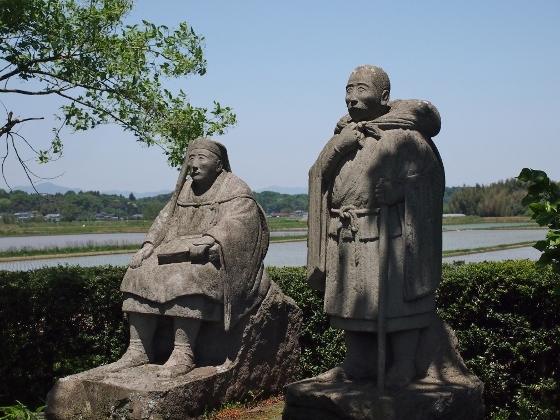 Photo above is a set of statues of Basho and his talented disciple Sora at Kagenuma Swamp Site. They visited this place in Kagamiishi Town on the way to Sukagawa. The site was no more swamp today but the surrounding area was all but beautiful rice fields. 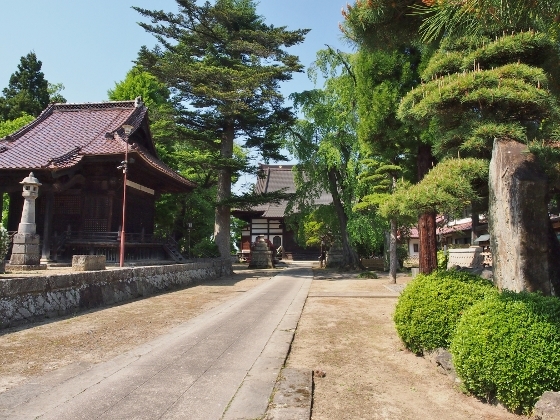 After leaving Shirakawa, the two walked along the old Oshu Highway. Today, only a small part of the road retains the atmosphere of that day. 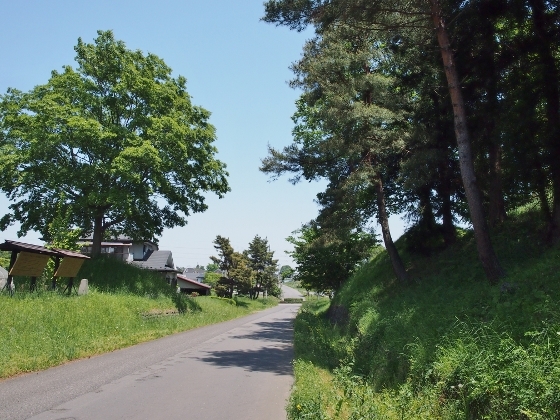 For example, the old road which runs through Gohonmatsu district of Yabuki Town shows similar view of that day as shown above except the paved surface. 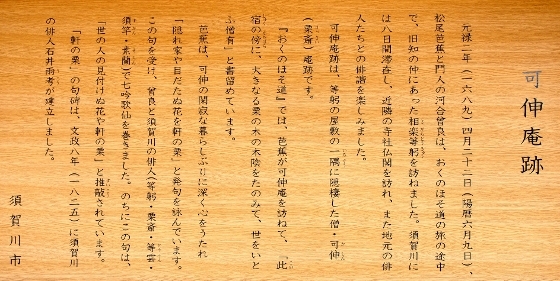 The panel tells us that two old tea houses used to host travelers with good water and rest. 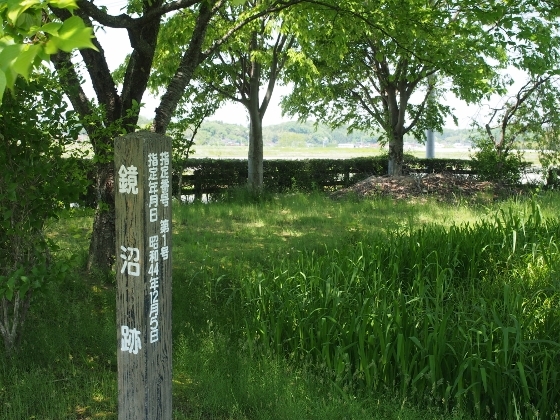 Photos above show today’s view of Kagenuma Swamp Site, where the statues of the two are located, and the history description. 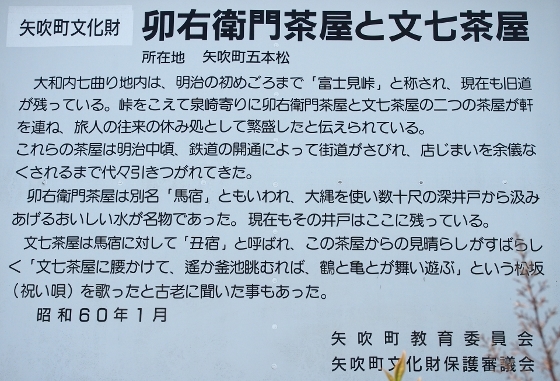 Then I stopped at another historic place called Serizawa Falls Site, where the two Haiku poets visited. 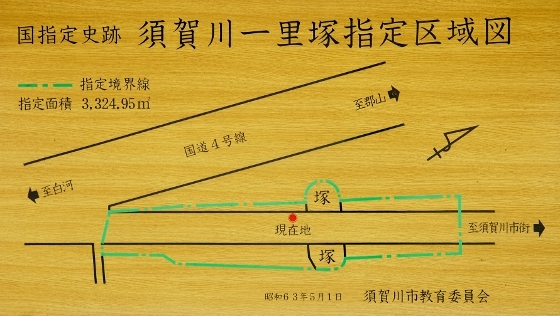 Today, only a board describing history of the site and a memorial remain at the site as shown in the pictures above. The board tells us the waterfall was full of water at the time of their visit. 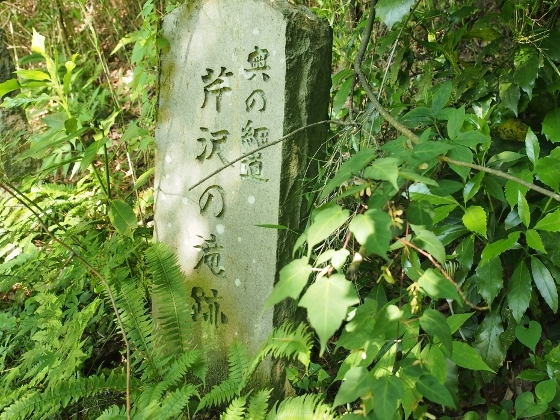 Entering Sukagawa along the old Oshu Highway, there was a historic milestone site called Sukagawa Ichirizuka Site as shown above. A couple of boards described the structure and the history. 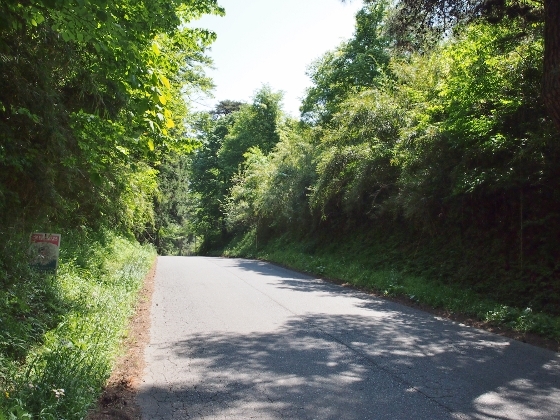 Mounds with trees on both sides of the road in the view show a set of milestones placed every 4km in the old days. This is a national historic site. 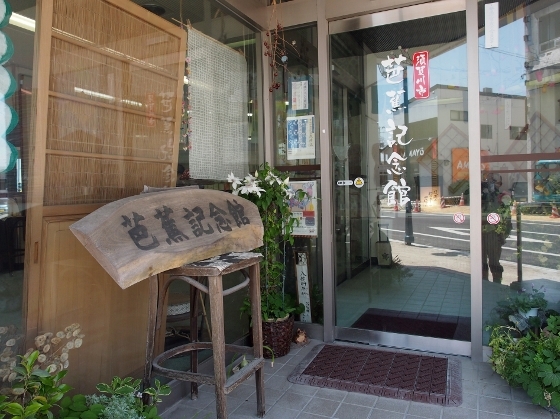 Basho and Sora finally arrived at the center of Sukagawa post town, which was called Motomachi. 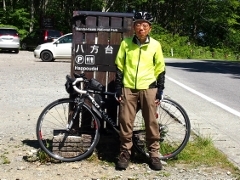 A man named Tokyu welcomed them and the two stayed in this town for as long as eight days. The house they stayed was gone but a sign board shown above told us the exact location. 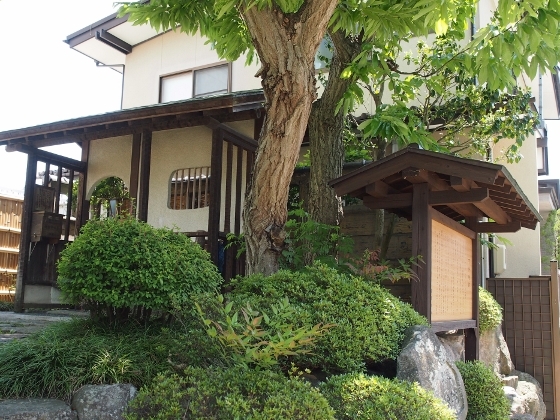 They also visited a simple house called Kashin-an shown above, which was owned by a friend priest of Tokyu. 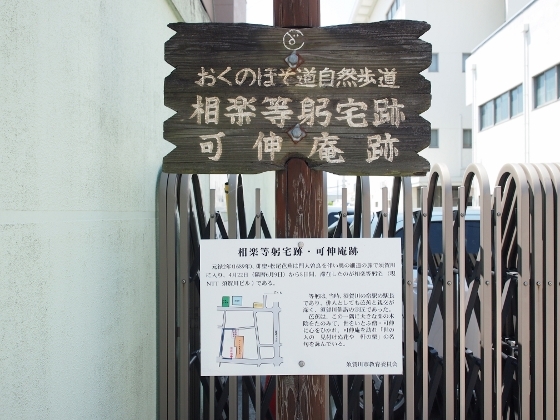 All these were located within a small historic area called Motomachi. 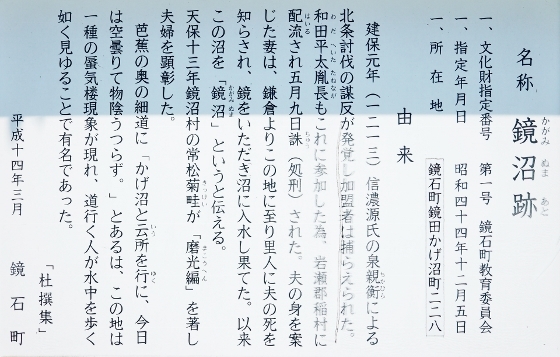 I found an interesting picture in a corner, which showed his popular Haiku poem “Furyuno Hajimeya-okuno Taue-uta” created during this visit. There also was a small museum in the same area as shown above called Bashokinenkan or Basho Memorial Hall which was dedicated to Basho. Staff members can provide detailed information and brochures free of charge. 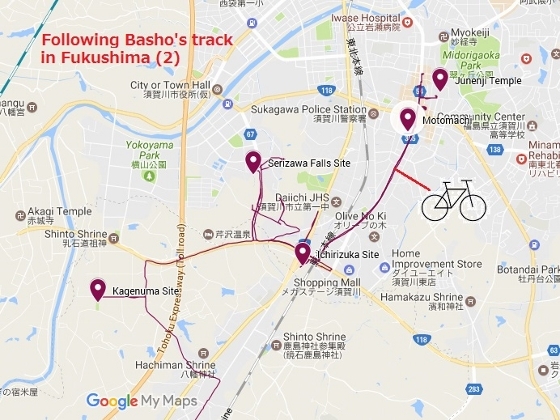 I stayed tonight near Motomachi area of Sukagawa and my bike trip continues tomorrow.